Somewhat young but not ones for waiting around, Kiids played more shows than there were weeks in 2013 under the previous name ‘J.Smith & the kids’ supporting artists such as Snakadaktal, Ash Grunwald, Jinja Safari, The trouble with Templeton, Saskwatch, Rick Price and Sons of Rico. Kiids were honoured to become a winner of the A&R departments ‘RAW’ indie song competition. The perfect way to top off an exciting year. The debut E.P ‘The Good//Bad times’ engineered and produced by Josh Telford (Silverchair, Eskimo Joe) showcases their use of epic choruses coupled with sounds that aren’t the usual suspects and lyrics that are penned from personal experiences such as true love, surprise tragedies, haunting encounters, a simple thirst for life and experiences on the road. An easy moniker for Kiids is indie rock, however that genre is vast and the sound of Kiids encompasses much more. It is emotionally charged, ambient & heavily dynamic. Kiids won’t be slowing down anytime soon with shows, supports and tours announced regularly as well as single and video releases set for March. Stay Tuned! 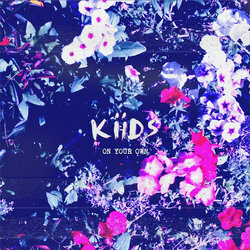 ‘Kiids’ new single ‘On Your Own’ lyrically deals with prolonged relationship paranoia however the instrumentation is more uplifting. Like most of their work the sound is ambient and heavily dynamic. A tempo much faster than its predecessors on the EP allows for a tense overall setting/mood.